When you are staying at the One&Only Palmilla, it is as although they have already thought of everything for you. They are the experts in those little details that make a huge difference. 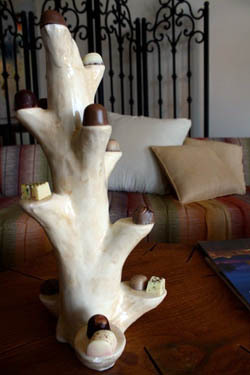 From personalized butler who sort your clothes by color to beautiful art decorated with chocolate truffles, you are in for a surprise when you stay at the One&Only Palmilla. The welcoming staff gives the signature salute – a hand over their heart – whenever they see you. When you check into your room at the One&Only Palmilla, you even recieve a welcome Tequila drink. Here is the recipe for their Tequila Mojito – a yummy classic with a Mexico twist. You may not have a butler at home, but at least you can enjoy the drink! Mix ½ oz of Ginger Ale with 2 bags of Brown Sugar, 3 Lime Slices & 6 Mint Leaves, muddle in cup. Add 2 oz of Tequila Clase Azul, Stir and fill with Ice.